Team Daniels and Team Kiss topped the podium on the second stop on the BC Junior Curling Tour. The Anita Cochrane Memorial Junior Cashspiel, held at Royal City Curling Club from September 23-25, saw 10 Junior Men’s and nine Junior Women’s teams compete for a cash prize and Tour points. At the end of the tour, the two Junior Men’s and two Junior Women’s teams with the most points will earn a berth to the BC Junior Curling Championships. 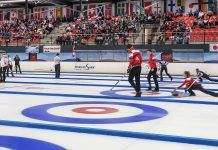 The next stop on the Tour is the Prince George Golf and Curling Club, from Oct. 7 to 9, which will host a total of eight teams. At the Anita Cochrane event, organized by 2013 BC Men’s champion Steve Kopf, the junior women’s finals saw Team Daniels (with defending BC champions Sarah Daniels and Megan Daniels) beat Team Brown, with three members of the Canadian Junior Women’s Championship team from 2013. The score was 12-4. Team Bourrassa edged Team Coulombe to come in third place. On the men’s podium, it was an all Royal City Curling Club affair. Team Kiss won gold beating defending BC Junior Men’s champions Team Tardi in the final with a score of 6-3. Team McCrady took third place, beating Team Wilson in the bronze game.